Accor’s Mercure brand is on its way to Sydney’s booming north-western suburbs. Sydney’s burgeoning north-western suburbs will soon be home to a new hotel option, with Accor signing a development deal to build Mercure Sydney Rouse Hill. The new hotel is currently under construction in the booming region, which from next month will be served by Sydney’s new metro rail system. Sitting alongside the hotel will be iconic dining and entertainment venue, The Fiddler, which itself underwent a major redevelopment in 2010. Development in the region is currently booming, with new housing developments and suburbs popping up, along with associated retail, schooling, entertainment venues and essential services to support the exploding population. The 78-room property is being developed by Accor in partnership with Lewis Land Group. It has been designed by Mostaghim & Associates and is expected to open doors to guests in the second half of 2019. Rooms will consist of 67 standard along with seven larger suites designed for families and four accessible rooms across the four-storey property. Property facilities will include a full fitness centre, swimming pool, conferencing and event spaces, while hotel dining will be facilitated by the adjacent Fiddler establishment. 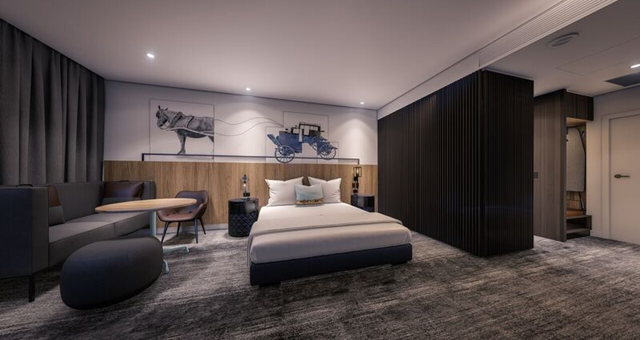 “Accor is delighted at the opportunity to partner with Lewis Land Group and introduce the Mercure brand to Sydney’s Hills District adding quality new hotel supply,” said Accor COO Pacific, Simon McGrath.